The Disinfection Mat features a strong mesh upper welded to an anti-bacterial PVC outer. Outer dimensions are 45cm x 45cm x 25mm depth. Liquid capacity is 3.5 litres. The mats can be used with any type of disinfection liquid and fit nicely inside the Jacson Cube® tray. To clean, place on edge, hose off, and leave to drain. The Jacson Cube® tray and disinfection mat combo comes with a sturdy 540mm x 540mm polypropylene tray and fitted disinfection mat to ensure the bottom of boots and footwear are thoroughly disinfected after cleaning. Simply add your preferred disinfectant solution to the mat. 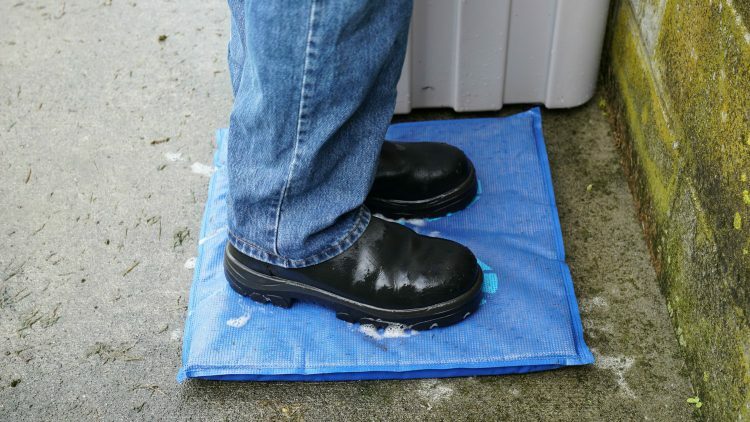 The tray can also be used on its own (without the mat) as a disinfection foot bath. The mat’s foam core is made with a strong mesh upper, and an anti-bacterial outer. Please note, Biosecurity NZ recommends both cleaning and disinfecting footwear as disinfectants don’t work through dirt.